QComp designs standard and customized adhesive dispensing systems that can increase productivity and save you money. 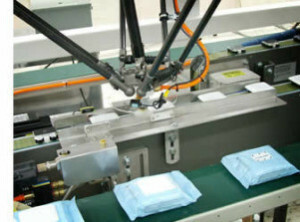 Utilizing a robot provides consistent dispensing density on the part as well as repeatability in the dispensing path. Using the robot to dispense adhesives provides flexibility in the application pattern as well as the ability to change from part to part using a bar code, RFID tag or other identification methods which recognize the part to be worked on. For a Free Demonstration using your actual product, fill out the form and a QComp representative will get back to you to schedule an appointment.